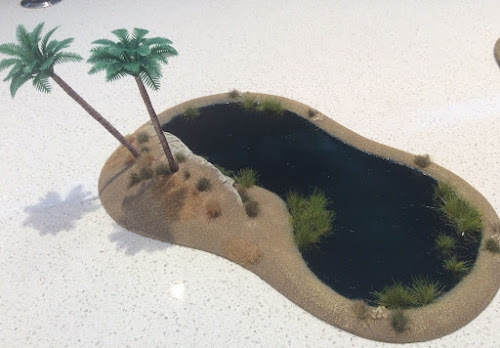 Over the past year I have been trying to build up themed tables of terrain based around new "mousemat" gaming cloths. Using the Norwegian Map Pack as a base I am working towards having ten pieces of themed terrain per table. Mid-2016 I purchased Gamemat.eu's "Sands of Time" battlemat. This gave me the ideal base from which to construct an "Ophidia" themed table. I own two large plastic Sphinxes that have been painted as weathered stone but wanted to tie other terrain choices in. 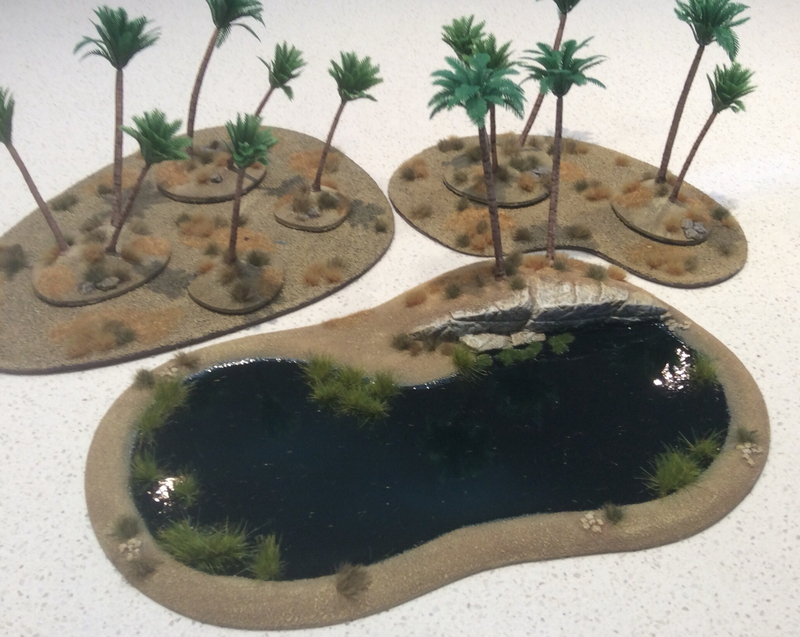 In the past week I have finished an Oasis (pond) and two copses of desert palms. 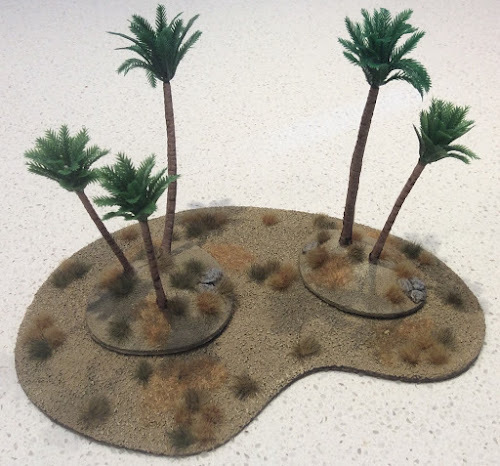 The base for these were GF9's BiaB terrain sets - specifically their Island Palms and Desert Oasis. 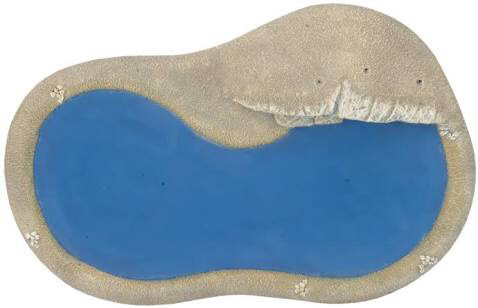 The Desert Oasis comes in a very "ultramarine" state. To me this looks very unrealistic so I decided to make it more acceptable. To do this I got out the Realistic Water and mixed in some washes so that I achieved a dark, foreboding colour with some real depth. 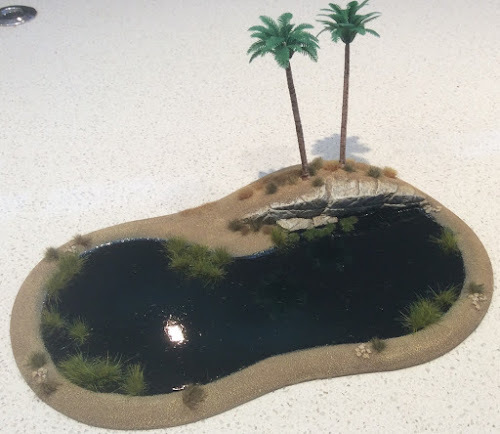 The water is more brackish and I think more realistic. I've also added some marsh reeds and tufts to make it more organic. The desert "woods" were the Island Palms with bases repainted to match the Oasis. The trees had a wash applied to their trunks and tufts were added for variety. I can't speak highly enough of these GF9 kits as a base for themed terrain. Using them allows you to spend 1-2 hours and achieve a great result. 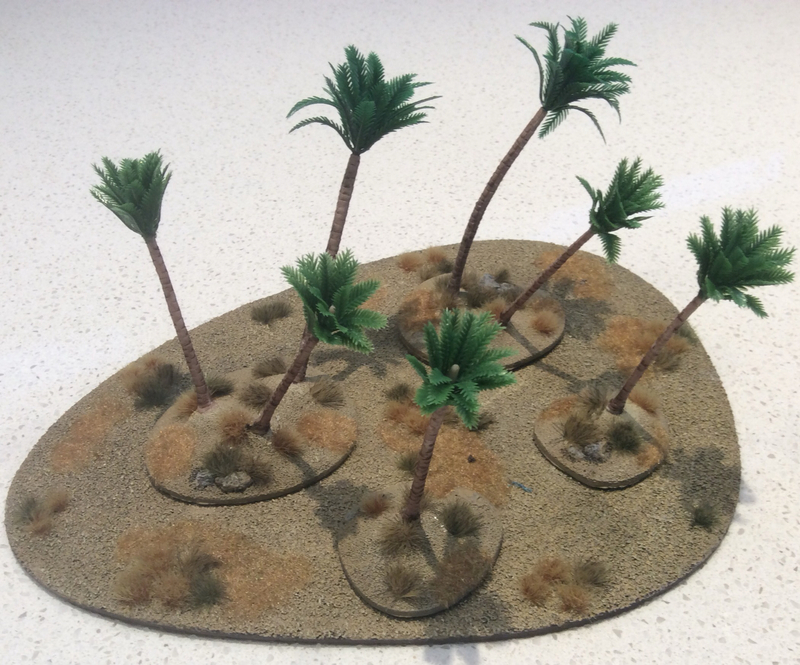 those terrain pieces look very nice Pete.